It has been a little over a year since we reviewed the Samsung Glyde U940 and encountered the problems associated with its capacitive touchscreen. Then a few months later Samsung refreshed the model with a more traditional resistive screen, which eliminated most of these issues. Now its replacement, the Samsung Rogue U960 has been released and we’re eager to see if Samsung got it right this time. 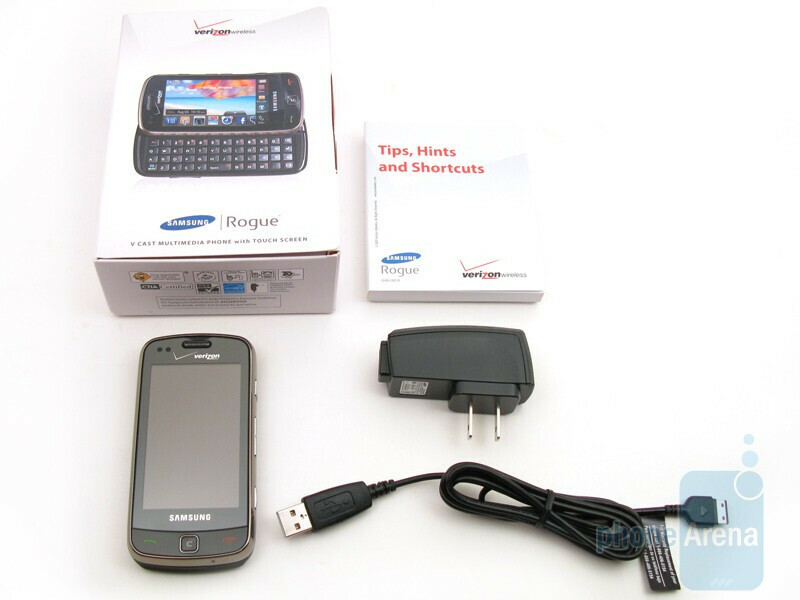 Not to mention that we are curious in how the Rogue compares with the LG enV Touch VX11000. Included in the retail package is the Samsung Rogue U960 phone, 960 mAh battery, wall charger with detachable data cable, and user guide. We like the fact that the data cable is detachable from the wall plug, which allows for a PC USB connection, but encourage Samsung to replace the phone’s proprietary charger/data port with a standardized microUSB interface. 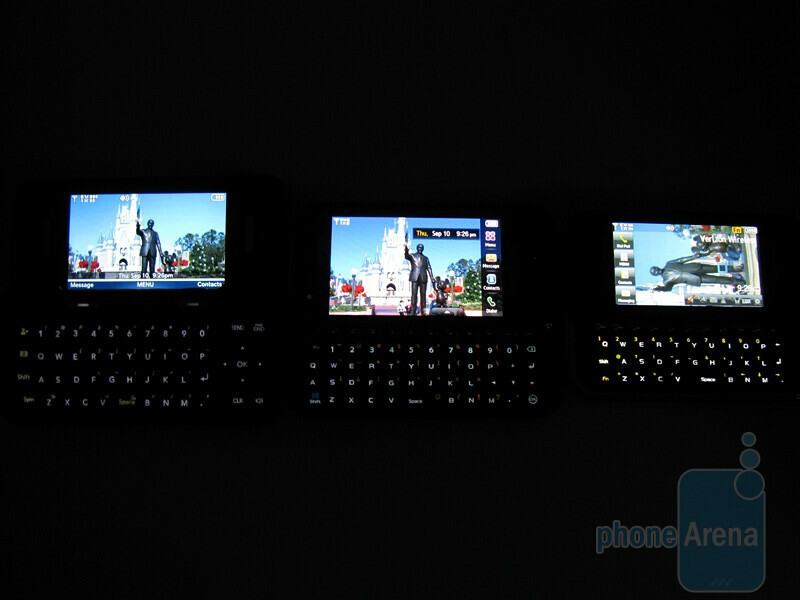 The Samsung Rogue U960 is physically larger than its predecessor, the Glyde U940, but still not as tall as the LG enV Touch VX11000. 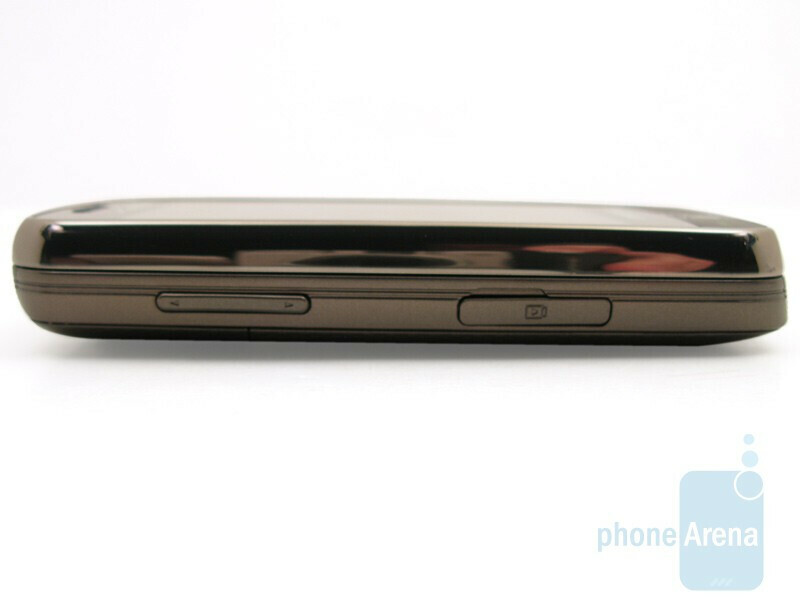 In fact, its design closely resembles that of smartphone, such as the HTC Touch Pro2, even though it’s not. 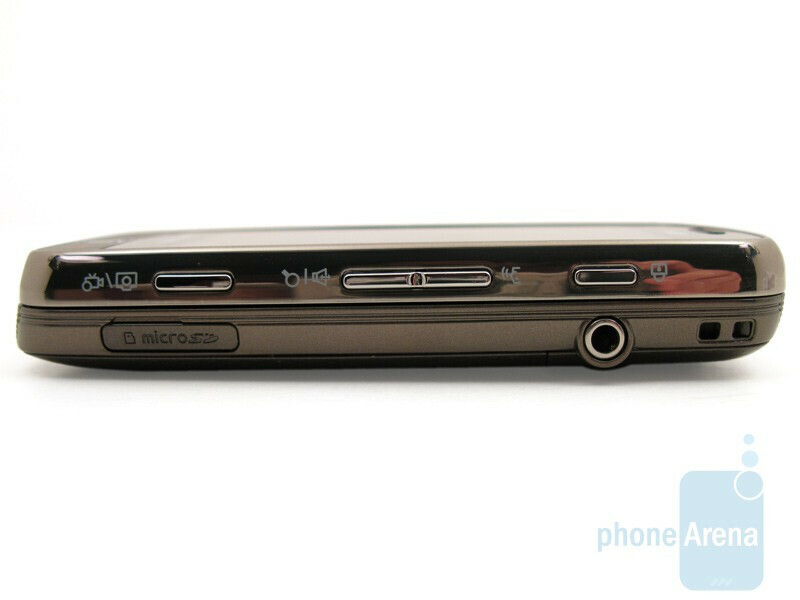 Despite this, it feels less bulky than the enV Touch and BlackBerry Storm and is very comfortable to hold, but is still noticeable when placed in your pant’s pocket and feels somewhat heavy. The front is dominated by the large display, which has black plastic surrounding it, with the light and proximity sensors at the top, and the Send, End, and Back buttons at the bottom. 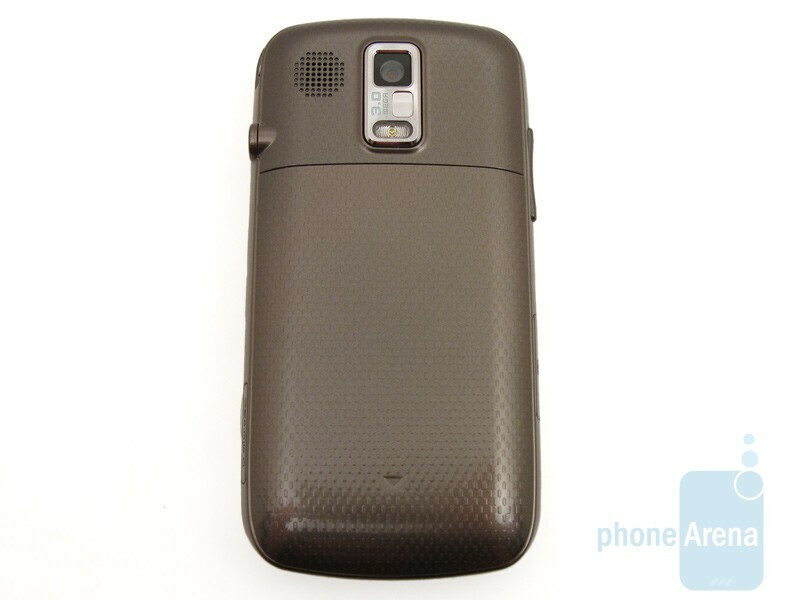 Along the sides are shiny chrome on the top half, with a brown metallic color used on the bottom half, where the volume rocker, data port, microSD card slot, 3.5mm headset jack, camera key, speakerphone, voice command, and lock key are located. The back of the Rogue continues this brown metallic color, but has a textured design. Not only is this fashionable, more so than the square lines found on the enV Touch, but also allows you to have more of a grip when holding. 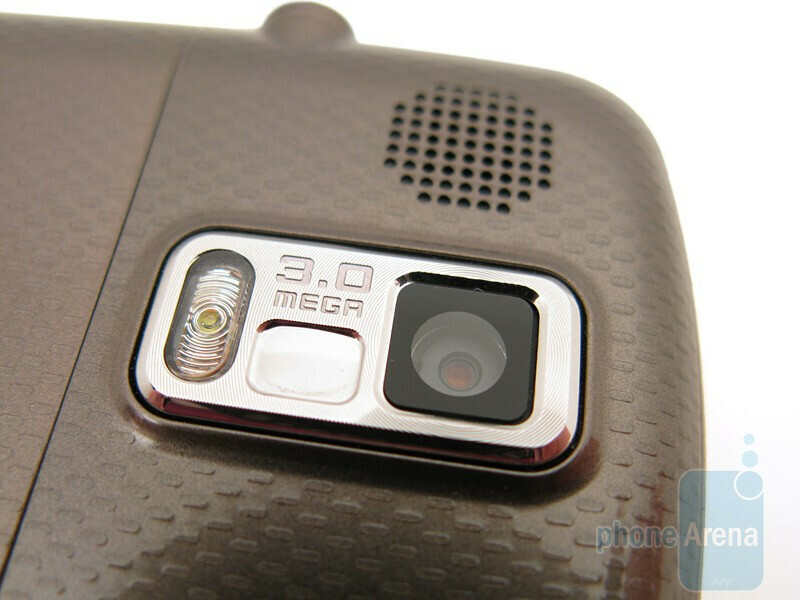 The only area protruding from the back is the housing for the 3MP autofocus camera and flash, where it is flush on the enV Touch. When comparing the two phones, we found the Rogue’s overall build quality to be better and more sold feeling, where the enV Touch didn’t feel as high quality. You can compare the Samsung Rogue U960 with many other phones using our Size Visualization Tool. The Rogue is Verizon’s first device to offer an AMOLED display. It measures 3.1 inches and has WVGA (480x800) resolution, as well as support for up to 262K colors. For the first time, images almost look life-like, with the best detail, color reproduction, saturation, and contrast than any other current Verizon phone has to offer. 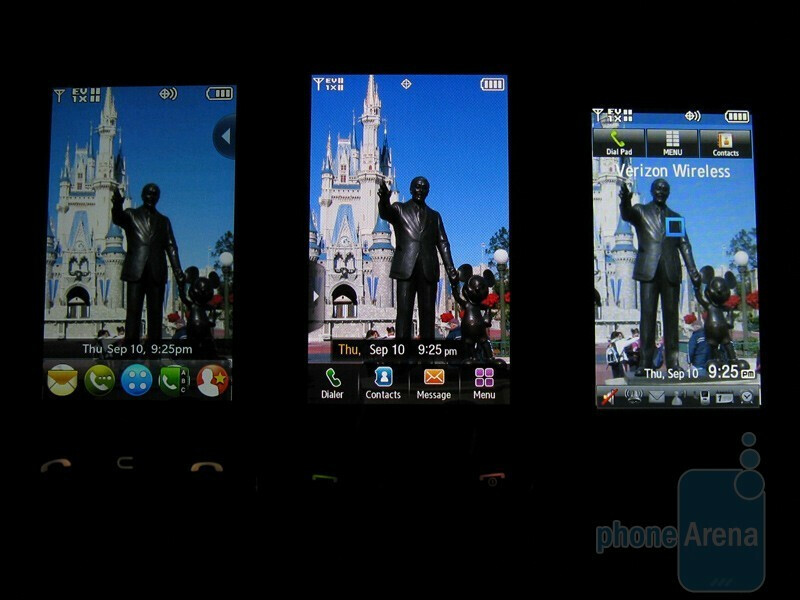 We loaded some high-resolution wallpapers and could clearly see how much better they looked on the Rogue than on the enV Touch, nor do images lose their quality when viewing the screen from side angles. You can also manually change the brightness of the display (between 0 and 5) or have it set to Auto, which will adjust the brightness based on the surrounding light level. 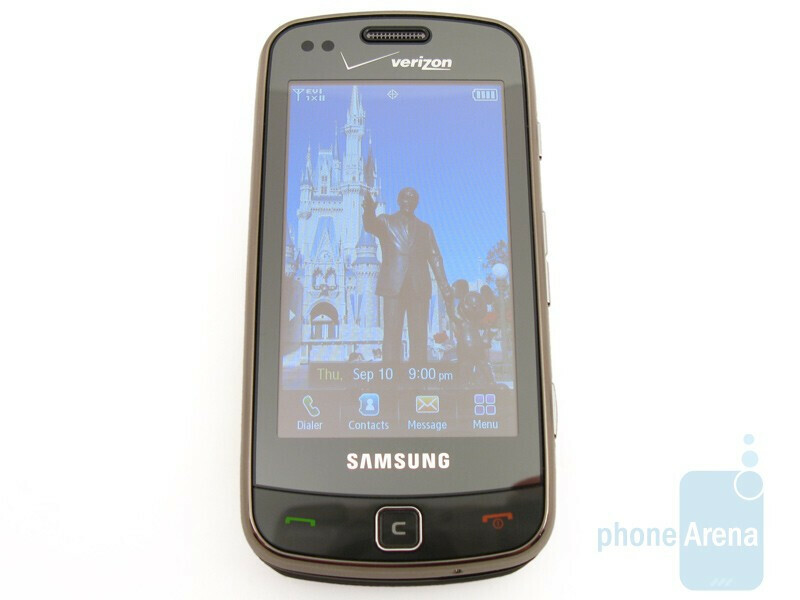 Since it is a resistive touchscreen, the top covering is clear plastic, but is still quite firm and doesn’t flex as much as the enV Touch or Voyager when pressed upon. It is also more responsive and doesn’t require as much pressure. Overall, we are very pleased with the display on the Rogue. Not only does it have the best looking screen from Verizon, but the problems that plagued the Glyde have been finally put to rest. 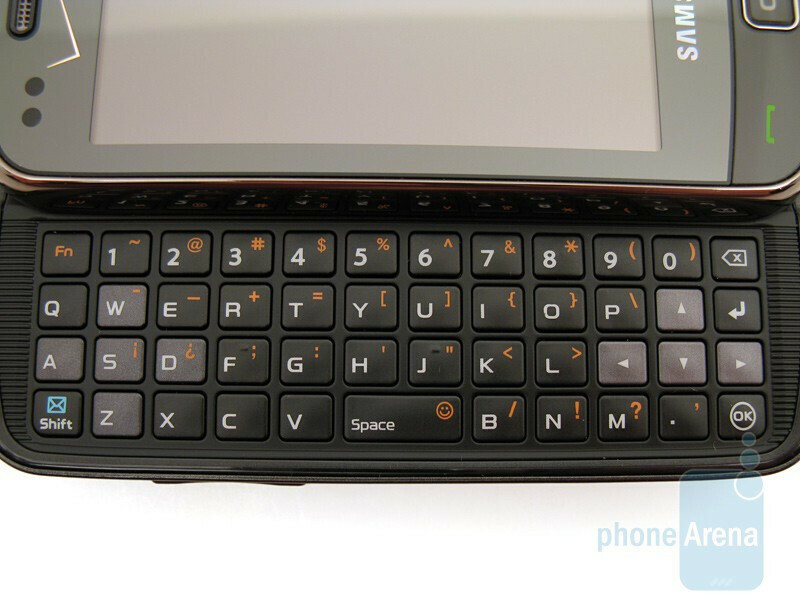 Keeping with Samsung tradition, the Rogue features a side-sliding QWERTY keyboard, where the LG enV Touch uses a clamshell design. The Rogue sports a 4-row keyboard (in contrast to the Glyde, which has only three rows) with the number keys now having their own row at the top and dedicated d-pad arrow keys on the right. These are welcome changes, as the Glyde’s keyboard was more difficult to use. 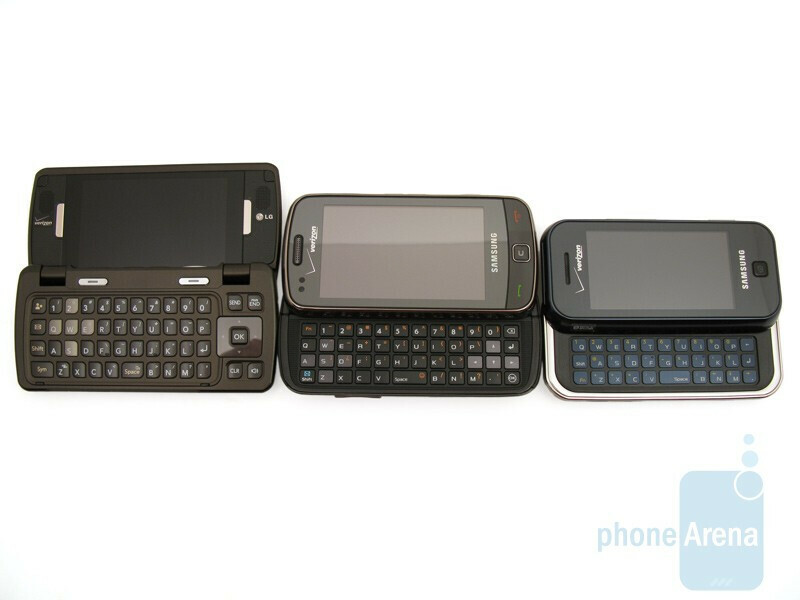 Because of this, we had no problems using the Samsung Rogue U960 for typing messages, as the keys provide good response when pressed, but are still a bit small, where the enV Touch has an overall larger keyboard. For people with larger hands, this could be a concern and we highly recommend trying both devices to see which keyboard you are more comfortable with. Looks like a nice device, but I've decided that it's not for me. Any chance of an Intensity review soon? The intensity is a little smaller and cheaper feeling. the camera isnt as good and it also can not take video. Also has the proprietary charger and has the smaller headphone jack. 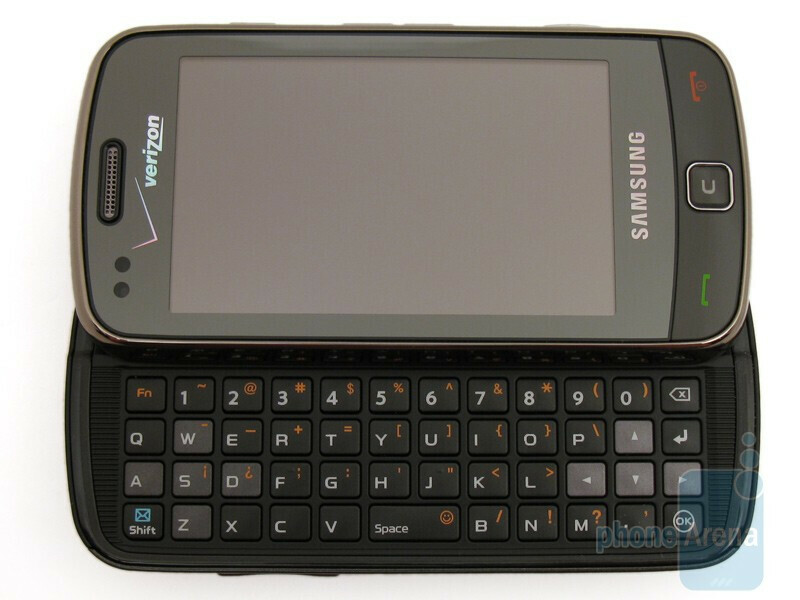 Its nice if you dont really want any type of multimedia and are just looking for a basic phone that has a keyboard. Then by all means its cheap and does the trick. But if you are looking to do pictures and videos and all those other multimedia things, id go with something else. Actually, with the touch wiz interface on this phone, it does allow for music multitasking. You can have the music player up on the homescreen and be playing and listening to music, while doing other things like texting, web browsing, or whatever. We do not see that on the Rogue. Unlike there Samsung Omnia there isn't a widget for the music player. The Rogue has widgets for alarm clock, birthday, bluetooth, calculator, calendar, clock, date, facebook, games, my favorites, my pictures, my shortcuts, my verizon, myspace, notepad, personal banner, photobucket, sketch pad, tutorial, twitter, widget settings, and youtube. Within the "my shortcuts" you can link to music playlists, but that uses the main music player. Megaman is correct actually, are you sure you arent reviewing a prototype instead of the final retail unit? Where are you seeing this? I just got the Rogue today and can't find any sort of music widget or tool to multitask with music. I was looking into getting the new Rogue but after seeing that only one display theme is included and the music player is outdated, I think the EnVTouch is more for me. The env touch music player does not correctly read id3 tags. You can copy and paste from the internet to a text, a text to another text, and text to internet. Just curious how certain you are that the touch screen problems are solved. I loved my Glyde and it worked perfect since I got it in mid-2008. It was only in the last month or so that I started to experience the touch screen issues everyone is talking about :( The phone has a mind of it's own! I love everything else about the Glyde, but feel like I'd be crazy to upgrade to the Rogue. Sounds like it is a completely different technology, so is that why you are sure it will work well over time? Thanks for the review! i got this phone back in 2009 and i still use it! never have had any problems with the device//i luv it still!! i have the samsung rogue, and i hate it. after a while it develops a BUNCH of problems! the picture on the screen splits in half, and random lines appear on the screen. sometimes when you open it, the screen doesnt switch, and lately when i open the keypad, the device turns off. also, the more you put on the phone, the crappier it works. DO YOURSELF A FAVOR, AND DONT BUY IT!!!!!!!!!!! i've been having problems with my samsung rogue. A couple months ago the touch screen would not work unless i pressed down on it real hard. Now the phone will turn on but the screen is black. I can't see anything and i can't make phone calls. Should i just go buy a new phone or is it fixable? I doubt i could fix it by myself...so i either pay someone to fix it or buy a whole new phone.